Now you can cut precision notches in virtually any material from 1/2" to 3" diameter. 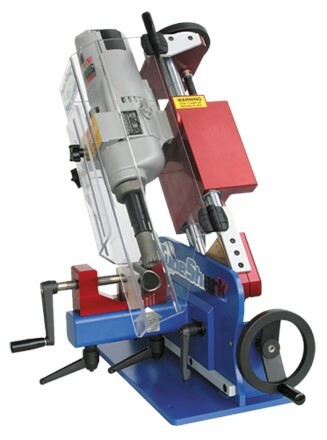 The TubeShark® Tube Notcher produces gap-free notches from 0° to 60° in thin or thick-wall tubing and pipe. RIGID - Heavy-duty 1/2" steel frame eliminates vibration. PRECISE - Precision machined, anodized aluminum billet block with oil-impregnated bronze bushings. POWERFUL - Heavy-duty industrial two-speed drill motor (11.5 amp, 250 & 500 rpm) for the toughest jobs. FAST - Precision gauges and adjustable hand crank and handles for easy set up and operation. FLEXIBLE - V-block vise adjusts for centerline or offset notching. ADAPTABLE - Notcher doubles as a drill press. Includes #3 Morse taper socket. VERSATILE - Uses standard bi-metal or carbide-tipped hole saws. Accepts 3/4" Weldon shank. Includes adapters for 1/2"-20, 5/8"-18 and 3/4"-10 threaded ends. This item will be shipped via Freight. Please call for a shipping quote.